This entry was posted in Clubs, Community and tagged Alabama Cooperative Extension System on June 30, 2014 by Wire Eagle. AUBURN UNIVERSITY – Alabama 4-H has been transforming young people’s lives for more than a century. Through a generous investment by the Alabama 4-H Club Foundation, Alabama 4-H will reach more youth with improved programming through its Centennial Youth Initiative. 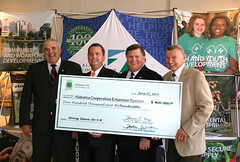 The Alabama 4-H Club Foundation will give $400,000 annually to support CYI and the expansion of 4-H within the state. Established in 1956, the foundation supports statewide 4-H youth education programs delivered by the Alabama Cooperative Extension System and generates private funds to meet youth educational needs. This entry was posted in Community and tagged Downtown Master Plan on June 25, 2014 by Wire Eagle. AUBURN UNIVERSITY – The City of Auburn and Auburn University are working together to implement elements of the city’s upcoming Downtown Master Plan and several other downtown-related projects, as part of the one-year, grant-assisted Urban Sustainability Accelerator program of Portland State University. Throughout the year, city and university officials will coordinate with experts affiliated with the program on downtown alleyway improvements, the intersection of Samford Avenue and College Street, parking improvements, pedestrian safety enhancements along South College Street downtown, rain gardens and a feasibility study of the daylighting of local streams. Other projects may emerge during the course of the year.